YORK CREEK VINEYARDS runs up and over the crest of the mountains to the west of the town of St. Helena, in a lush and beautiful area long known as "Spring Mountain." 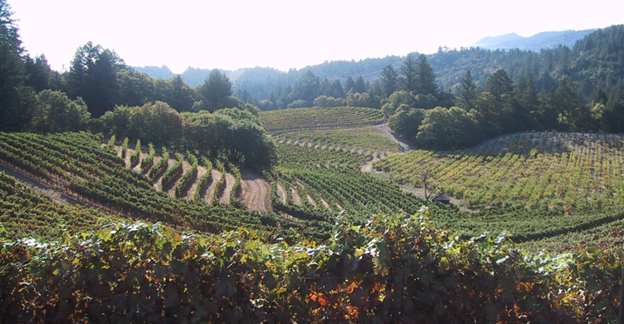 Wine grapes have been grown here for more than one hundred years, and we have vines in both Napa and Sonoma counties. At least twentyfour tree species are native here; an extraordinary richness of flora perhaps unequaled anywhere in California's Coast Range. Read what the San Francisco Chronicle and the Napa Wine Project are saying about Fritz Maytag and York Creek Vineyards. We have roughly 125 acres of grapes high above the Napa and Sonoma valleys, on the crest of the Mayacamas Range of mountains. Our winery project began in the early 1990s with our own equipment in other people's wineries.